First step is to click on the File button and then click on Info. Now, if the checker detects possible accessibility issues, a message box will appear beside the Check for Issues tab or button. In order to see the issues and have an idea on what to repair, click on the Check for Issues Tab then click on Check Accessibility. The file which has issues will reappear and the Accessibility Checker panel will show the result of the inspection. There will be messages showing the reasons why the file needs to be fixed. Each issues discovered by the checker are sorted as error, tip, or warning. 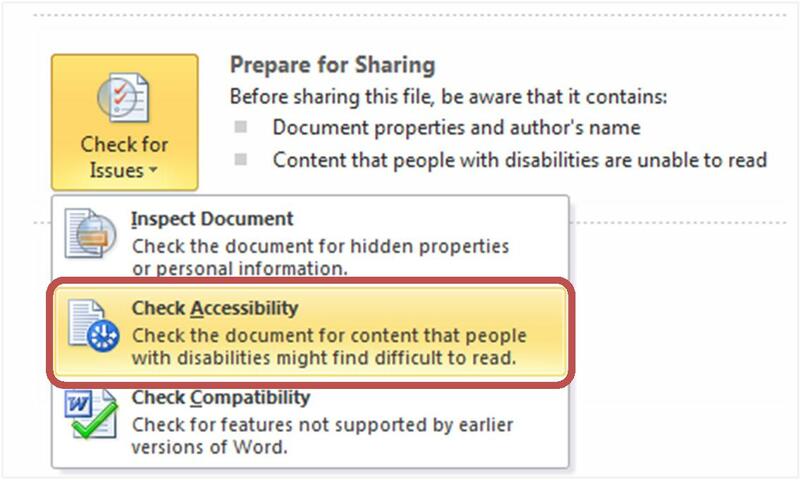 An error is part of the content that makes your file quite difficult or at most impossible for individuals with disabilities to comprehend your content. A warning is issued when certain parts of the file is not friendly with persons with disabilities to comprehend. A tip is issued in order to improve the content of the file to make it friendlier to persons with disabilities. Take note that fixing the problem might require some reformatting, updating, and altering some parts of the content. Check the rules for Accessibility in order to know more details on this matter. Install PowerPoint when you download MSOffice programs here!